Trickbox TV provides multi-camera OB services in London. Andover, UK - October 2015: London-based broadcast services provider Trickbox TV has purchased Trilogy Communications' Messenger intercom system to complement its expanding multi-camera flyaway operations. 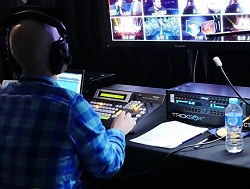 Trickbox TV provides multi-camera OB services for a wide variety of productions including broadcast, live events, corporate events, and web streaming. Recent projects include ITV’s Flockstars, and live coverage of American football’s NFL Draft. In order to improve communications between crew, Trickbox TV needed a portable, compact, and reliable intercom system as part of the development of its PPUs (portable production units) and flyaways. Messenger fulfils the need for a cost effective intercom solution without the installation, operational and future expansion constraints of more traditional 2- and 4-wire systems. From a factory configured base system, Messenger has the flexibility to continually evolve to meet the emerging communication needs of the organisation for which it is deployed. In the case of Trickbox TV’s typical multi-camera flyaway environments, every operator in a control area can now have individual talkback panels, and camera operators now have full talkback, including a discreet engineering talkback channel to communicate with lighting and vision teams. Because Messenger can handle 4-wire inputs and outputs, integrating presenter, radio, and third-party talkback is very simple.